The Venus Express spacecraft was launched on a Soyuz-Fregat rocket from the Baikonur Cosmodrome at 03:33:34 UT on 9 November 2005. The three-stage Soyuz launcher lifted the Fregat autonomous upper stage (fourth stage) with Venus Express mounted on it into a sub-orbital trajectory. After separation from the Soyuz third stage, a Fregat main engine burn (at an altitude of about 200 kilometres) for around 20 seconds placed the Fregat-Venus Express composite into an almost circular parking orbit. 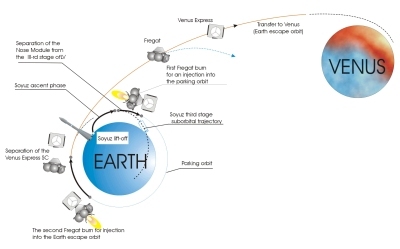 After a coast phase of about 70 minutes in the low Earth orbit, a second Fregat engine burn, lasting 16 minutes, moved the combined craft from the parking orbit onto an escape trajectory, after which the Fregat stage and Venus Express separated. After separation, Venus Express spent approximately 150 days in an interplanetary transfer orbit. During this phase, trajectory corrections were performed using the spacecraft's own thrusters.